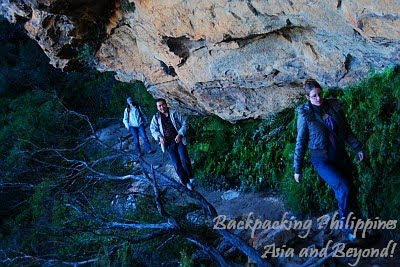 The route to Blue Mountains passed by the site of the Sydney Olympics 2000 and the first part of Blue Mountains tour itinerary was the trek to Wentworth Falls, only one of Blue Mountains National Park's numerous waterfalls. Trek down Wentworth Falls is easy with marked trails some with steel railings and concrete steps. Wear comfortable trekking shoes and practice safety tips even if it's a relatively easy trek. 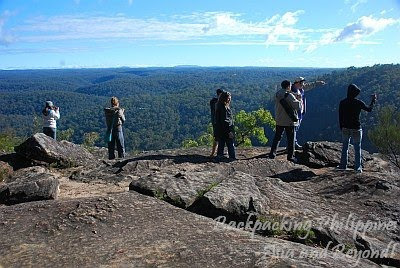 Several viewpoints were visited including the one below where the last viewdeck located at the top end of the falls can be seen filled with curious tourists and also giving the viewer scale of Wentworth Falls' height. Wentworth falls is a nice waterfalls but you can't swim in the falls' basin during winter unlike in most waterfalls of the tropics that are really inviting for a refreshing dip. Swimming is only for those with wetsuits plus the trail is more for usual tourists than backpackers looking for unspoiled places. 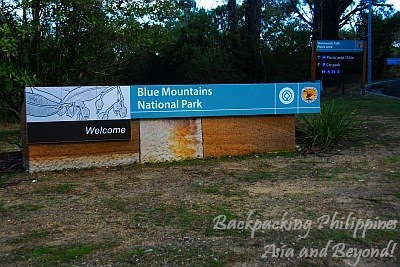 Why's the national named Blue Mountains? Well, the mountains really blue-colored caused by the mist that came from the abundance of eucalytus trees emitting the mist giving the mountain it's natural blue hue. The Blue Mountains National Park is a UNESCO World Heritage site under natural criteria due to its outstanding universal value. Its eucalypt forest, swamps, wetlands and grasslands are home to to a long list of endemic Australian flora and flora. The world famous Three Sisters rock formation of Blue Mountains National Park and Scenic World cable car ride. lovely, lovely! how i envy you! Wow, that waterfall looks pretty spectacular! that's amazing. glad you had this chance to see and experience it in person. sana ako din someday. enjoy the rest of the work week. I can't wait to see the Three Sisters rock formation or maybe even climb it.